This essay will describe the spectrum of imaging modalities that are commonly used in the knee and their specific advantages and limitations. Additionally, a selection of 10 frequent causes of anterior knee pain in the pediatric population, both acute and chronic, will be reviewed. Anterior knee pain is one of the most common musculoskeletal complaints in the pediatric population. Chronic anterior knee pain, either posttraumatic or without evident cause, occurs in +/–20% of children and adolescents. A thorough history and physical examination are essential; however, the nonspecific clinical findings often require imaging techniques to obtain definite diagnosis. Conventional radiography (CR) is still considered the first-line examination, particularly in trauma setting or for detecting congenital or developmental anomalies. Computed tomography (CT) is used most frequently to evaluate complex or intra-articular fractures of the knee or for preoperative planning and postoperative evaluation. Ultrasound (US) is a quick, radiation-free, and cost-effective technique to evaluate the superficial structures of the knee. Therefore, it is one of the most frequently ordered musculoskeletal procedures in diagnosing traumatic and nontraumatic pediatric patients with knee pain (often interpreted together with X-ray). In the last decades, magnetic resonance imaging (MRI) has become widely available, and there is an increasing trend toward early use in pediatric cases of (anterior) knee pain. Its exquisite contrast resolution allows successful visualization of both intra- and extra-articular soft tissues, while simultaneously displaying the osseous and soft tissue structures of the knee. Most cases of pediatric anterior knee pain are idiopathic. Nonetheless, this should be considered an exclusion diagnosis after thorough clinical (and imaging) workup. Pathologies seen in older adolescents – those approaching skeletal maturity – resemble these of the adult population (Figure 1). Younger patients are more prone to pathologies specific to their immature bone structure (Figure 2). In these skeletal immature patients, ossification variants are often an important differential diagnosis of fractures. Knowledge of these additional ossification centers is essential, especially in trauma settings (Figure 3). The image on the left is a conventional radiograph of the right knee. The image on the right shows a patellar fracture (large arrow) in a 15-year-old girl involved in an MVA. Additional hemarthrosis is present (small arrow), with fat particles in the suprapatellar recess. Conventional radiograph of a 12-year-old boy with persistent knee pain after a fall 10 days earlier. There is a small avulsion at the underside of the patella, consistent with patellar sleeve avulsion (large arrow). 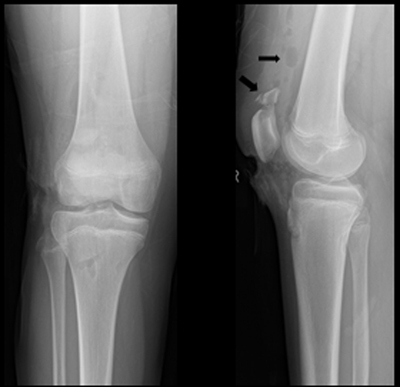 Additional findings include a nonossifying fibroma posterior in the femur (small arrow) and an irregular aspect of the tibial tuberosity (arrowhead), possibly due to Osgood-Schlatter disease. Conventional radiograph of a 9-year-old boy with persistent knee pain after a fall 2 days earlier. 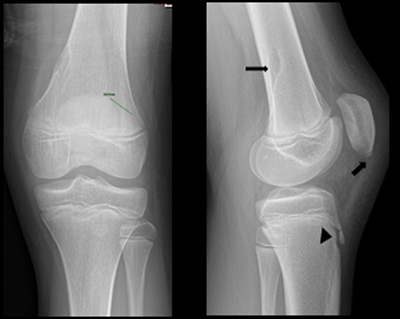 There is a radiolucent line posterolateral in the patella with a loose fragment (arrow). 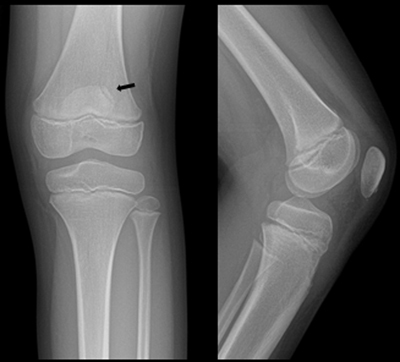 The localization of this fragment is typical for a patella bipartite.